Options not included may be shown. Our proprietary dual-stage latching mechanism and "pre-load" design prevent vibration and wobbling to help ensure whether you are on the toughest off road trail or loading gear into the back of your Jeep. The secret to our tire carrier's success is our in house designed and constructed greasable hub assembly. Instead of a single bearing like, we use dual tapered bearings for smooth and consistently reliable operation. Longer off road excursions require more cargo and fuel. Our design is the perfect platform for accessories. Our optional heavy duty driver and passenger side Tank Mounts and Cargo Rack bolt on to our tire carrier to give you space you need for extended range or duration trips. With the addition of our rear bumper comes the opportunity to also protect your exposed and critical muffler. Our bolt-on RH-5001-A Muffler Shield mounts to existing holes on our rear bumper giving you a plate of solid 3/16" steel armor. Once your muffler goes your trip is over and it's time to call a tow rig. This simple addition to your RH4x4 rear bumper gives you peace of mind and increased capability. High clearance design to maximize departure angle. Bolt on tailgate streamer bar helps apply preload to closed tire carrier gate preventing vibrating and wobbling. A Rock Hard 4x4 exclusive feature. Adjustable design allows you to move your spare tire up and down or in and out for best fitment and visibility. Laser cut Hi-Lift jack points for vehicle recovery and trail repair. Drop down safety pin automatically prevents tire carrier closure when open on uneven ground. Integrated welded on CB antenna mounts standard on every tire carrier. Integrated Hi-Lift jack mount standard on every tire carrier. Welded on security tab allows you to use a cable style lock to prevent Hi-Lift jack theft. Zerk style grease fitting to service hub assembly. 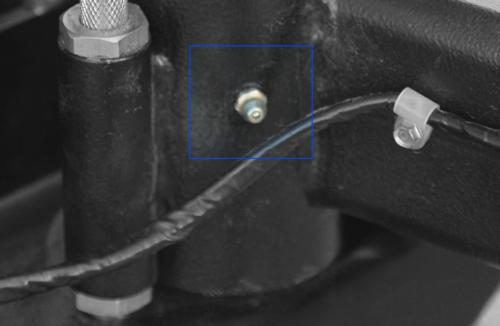 Period greasing of hub assembly is suggested. Simply add grease to the included zerk fitting in the hub assembly after water cross, rain storm, etc. Why don't you offer recessed lighting like some other brands? Rock Hard 4x4 parts must work as good as they look and in the real world the reverse lighting solutions offered by other brands don't function very well at all. When reversing, you don't need lighting straight back - you need lighting back and to the sides to help guide you in the dark. That's why we don't lock you into a poor solution that's in reality a gimmicky solution. Instead, we suggest you mount your choice of back up lights to the top of our bumper, on the sides, and aim them at angles. Heavy duty and good quality. Latch system is super easy and convenient to open. The best part is the Stop that keeps the gate in the open position when out on the trail. Excellent service. Received my bumper within 9 days of my order. I reviewed the video on line and then followed the printed instructions. I recommend doing both. Install went perfect. Looks great and tire carrier works great. Well made and I Love that is US made as well. Read the directions or watch the entire video before installing. After reading and watching the installation was a breeze.